The faculty and staff at Southern Oregon University are dedicated to your success at every level. Our programs are challenging, creative and practical. Students connect what they learn with the community through internships, capstone projects, and research. 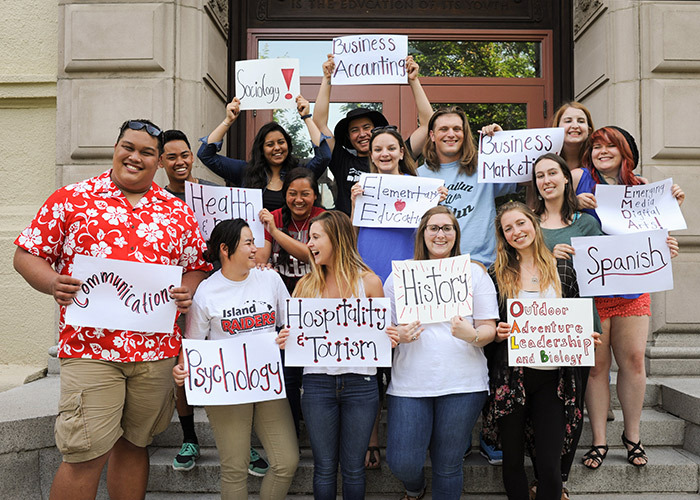 With a campus of over 6,200 students and a culture of engaged faculty, the SOU community emphasizes diversity, inclusion, and focuses on preparing students to live and lead in a multicultural, global society. SOU students have plenty of degree path options and can pursue their educational goals through 36 areas of study in a dynamic range of fields. Internships, mentor relationships, field study, capstone projects, volunteer opportunities, and civic engagement allow our students to apply learning into meaning. Our supportive learning environment fosters creativity, innovation, and builds a solid foundation for success. Southern Oregon University is committed to sustainable practices, environmental stewardship, and research that advances our understanding of local, regional, and global environmental issues. Student leadership is an important part of what makes SOU a wonderful place to live and study. With staff and faculty support, students at SOU can step into their own leadership and learn to manage and operate a wide-range of student resources including outdoor adventure programming, community gardens, film screenings, bicycle services, an organic farm, and more. SOU has been nationally recognized for our commitment to operational sustainability. SOU was recently honored with the Best Case Study Award by the Association for the Advancement of Sustainability in Higher Education, was the first university in the nation to certify as a Bee Campus USA, and now boasts LEED Gold campus housing. Southern Oregon University is a place where the passions of our students combine seamlessly with an outstanding education in a unique location.